Mod note: our technical expert @DonH56 wrote this series article a while back. As I get time, I am porting them here. Alternating current carriers in a conductor tend to travel near the surface. This happens due to opposing eddy currents from the magnetic field generated whenever alternating current (a.c.) flow is present. These are not generated by direct (d.c.) flow since current flow is all in the same direction and thus opposing eddy currents are not created. The effect is frequency-dependent, resulting in carriers traveling closer to the surface at higher frequencies. 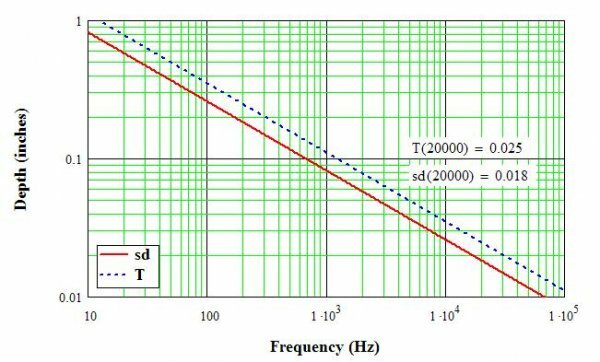 Because less cross-sectional conductor area is used as frequency increases, the effective resistance rises as frequency increases. Note that at d.c. (0 Hz) the entire cross-sectional area of the conductor is utilized. Skin depth (sd) is the depth at which current density has fallen to about 1/3 (actually, 1/e, or about 0.37x) the density at the surface. The definition arises from EM equations beyond the scope of this article. A related term is the penetration depth (T), the depth by which virtually all current in the conductor flows. If the depth is greater than the conductor’s depth, then the conductor’s entire cross-sectional area will be used and d.c. and a.c. resistance will be essentially the same. At higher frequencies, only part of the conductor’s depth may be used, and effective (a.c.) resistance increases. Figure 1 shows both parameters (skin depth and penetration depth) over frequency, from 10 Hz to 100 kHz, for copper wires. As you can see, by 1 kHz it is around 0.1”, and at 20 kHz the skin depth is only 0.018”, with T = 0.025”. This is for an isolated wire; parallel or coaxial conductors cause a slight (~3%) change. How much this matters in audio circuits is a matter of debate (of course). 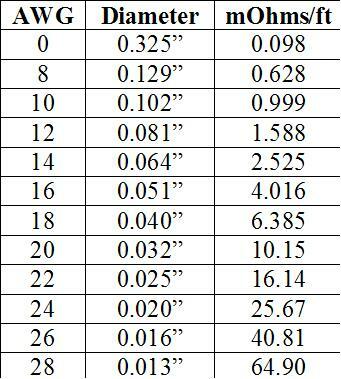 The table below shows the diameter of various wire gauges commonly used. Note that stranded or solid wire type has little impact on these calculations, though d.c. resistance is just a hair higher for stranded wire. Litz wire, bundles of smaller-diameter insulated wires, can be used to reduce the impact of skin effect. At 20 kHz, all the diameter of 22-gauge wire or smaller is utilized, and a.c. and d.c. resistance are essentially the same. Larger wire will be impacted by skin depth, with only about 31 % the diameter of a 12-gauge wire being utilized to carry signal current. However, note that the d.c. resistance of AWG 12 wire is only about 10 % that of AWG 22, so even after giving up so much due to skin effect, you are still better off than using the smaller wire. In the real world interconnect impedances are so much higher than wire resistance (for typical cables) that skin depth is a non-issue, IMO. For speaker cables, while there is a clear argument for larger gauges to improve damping factor and provide high current capacity, skin depth is generally not a concern because the cables are larger and higher impedance can usually be tolerated at higher frequencies. Recognize that the d.c. resistance of a 10-foot piece of AWG 12 cable is only 0.016 ohms, still a very small number compared to the impedance of most speakers, so if skin depth doubles or triples that value at 20 kHz it is still a very small fraction of the load impedance, and much smaller than the output impedance of most amplifiers at 20 kHz. This will not stop the debate, of course. School is definitely IN today. THANK YOU to the author and mod! Is it not true that for a circular wire the issue is the area of the annulus through which the current flows relative to the cross sectional area of the circular conductor, rather than the "skin depth" per se? Thus, for example, for a T of 0.025" a 16 gauge wire will essentially be entirely conducting. whereas for a 12 gauge wire the outer diameter= 0.081", "inner" diameter= 0.081-0.05= 0.031 and the current is contained in 85% of the conductor. Now for a hand waving argument. If skin depth is used rather than T, then the conductive % of the conductor area for copper at 20kHz is 69%, and about 87% at 10kHz- that is, the "resistance" is 45% greater at 20k and 15% greater at 10k. So, for a single 12 gauge copper wire, skin effect can be approximately modelled as an inductor in series with the resistance with the impedance of the inductor at 20kHz about equal to the value of the resistance. (Please correct this if there's some error). This can be useful in modelling the interaction of amps , cables, and loudspeakers. For example I have a pair of electrostatics that are driven from a tube amp with some global negative feedback. The amp has a relatively large DC output resistance with a substantial series inductance mostly due to the decreasing amount of negative feedback vs. frequency. The electrostatic speaker looks like a cap in series with an inductor and a resistor. Knowing the inductance/resistance of interconnect wire has been very helpful in understanding and controlling the HF response of the combination- basically you need to use multiple parallel 12 gauge wires kept as short as possible to avoid HF loss due to the speaker/amp/cable resonance. The power amps are right next to the speakers with fairly long interconnects from the preamp to the power amps. For example I have a pair of electrostatics that are driven from a tube amp with some global negative feedback. The amp has a relatively large DC output resistance with a substantial series inductance mostly due to the decreasing amount of negative feedback vs. frequency. And right there, you have the reason to not worry about the wire much- the amp's source impedance will swamp it. Let's put some numbers to it. I use 12 gauge wire to connect my speakers. The length is about 3 meters. So at 20 kHz (well beyond what I can hear, but let's pretend I'm still 16 years old), the change in resistance is about 0.02 ohm. How does that compare to the source impedance of a tube amp? Negligible, of course. How does that affect the frequency response because of the voltage divider formed? Again, negligible. edit: Let me throw out the typical FUD-peddler deceit for fun. The wires I use have a resistance at low frequency of about 0.015 ohm per leg (i.e., multiply by 2 for the round trip). The skin effect causes that resistance to more than double at 20 kHz, which is over 6 dB! Disastrous! Of course, for an amplifier with a 1 ohm source impedance (typical for a tube amp with feedback) and again waving away vectorial addition, the actual series resistance goes from 1.015 to 1.035. That ain't much change, and if you do things vectorially, the change is actually a bit smaller than that. From a voltage divider POV with a speaker load, the change in frequency response will obviously depend on the amp source impedance (with higher source impedances having less effect), but even with a good amp having source impedances in the tens of milliohm range, it's less than 0.1 dB. I didn't say that the skin effect was critical, in effect I was saying that it was less important than the post was implying. Actually, the DC resistance for a 10 ft length of 12 gauge is about 16mohms (ignoring contact/connector resistance) but the TOTAL effective inductance is about 12uH. At self-resonance (about 30kHz) the Electrostat looks like a 600mohm resistor, and the tube amp output impedance looks like about 1ohms, mostly inductive. At 20k the inductance of the single 12 gauge wire has an impedance of 2*pi*20000*12E^-6= 1.5ohms! It would represent the dominant impedance in the resonating "tank" that is the amp/cable/speaker combo. I have 2,12 gauge wires, in parallel, of roughly 5 feet length from the amp to the speaker terminals, so the inductance is about 3uH and it remains a significant, but manageable, component in the overall response characteristic. I have simulated the modeled system and measured the speaker response and they are in pretty good agreement. Actually, the DC resistance for a 10 ft length of 12 gauge is about 16mohms (ignoring contact/connector resistance) but the TOTAL effective inductance is about 12uH. but even with a good amp having source impedances in the tens of milliohm range, it's less than 0.1 dB. That's more than enough for me to ascribe absolutely phenomenal changes, that would be audible to even the most cloth-eared non-audiophile. Yes, I'm aware of that calculator. This produces (for a single cable half there and back) 4.9uH + 4.9uH for a 3m long cable- that is 9.8uH plus an allowance for skin effect- which is where I get the approximate 12uH number. But that number is not correct for ordinary zip cord (in my case, sourced from Home Depot as extension cord and the ends cut off), which seems a perfectly good choice for that application. I'm not sure of the logic of working to deliberately increase the loop area, but everyone has a hobby. ADI alum? You probably know my old buddy Scott Wurcer. Yes, I certainly do. We both worked in the Linear Operating Group for a while although I moved onto other things while Scott continued to work on opamps. We both ended up as ADI Fellows- Scott in 1996 and I in 1991 and then Senior Fellow in, if I remember correctly,1996. That kind of experience will be a great asset to the forum. I hope you hang around and contribute. We can be a great retirement hobby. Thank you. Very interesting. I'll read your article. I'd forgotten how pompous some of these articles sound... A lot of them are going on ten years old as well so some references may be out of date. Yes, skin depth says how much of the conductor will be used, and especially at LF the penetration depth is more reasonable. Pipes, e.g. conductors that are hollow on the inside (e.g. used for high-power transmission systems), are another special case since the EM fields are constrained in the center. Disclaimer: My last EM courses were decades ago so don't ask me to explain that stuff. Using an ideal inductor as a first-order model with a series R equal to the DCR will get you in the ballpark. Modern simulators allow you to curve fit and/or create a nonlinear inductor that is a better fit. BUT, I have found that to be important at RF/mW/mmW; not so much at audio (where I normally ignore skin effect anyway). Aside: We undoubtedly share a cross section of friends in and out of ADI. My main career until about ten years ago was designing high-speed data converters and other analog/mixed-signal ICs. All we need to do is make speaker wires that split the AC into two different DC signals on two different wires and then put it back together without degrading the sound (much) and we'd be rich. Or use the government-conspiracy-suppressed Tesla technology to beam the audio directly to the speaker. Or the alien technology locked in Area-51 to beam it directly into our consciousness.